Yes, choosing the right IP camera is not an easy task. And all the available models and many features makes you wonder which one will be the right choice. Well, we think, the right choice is something like this great time-laps you see above – weather data layer on top of crisp high quality picture, with good field of view, and clear focus. Keep reading, because today we list 5 quality devices that deliver great value, have all the necessary features, and have good track record among the users. For many weather enthusiasts and pro users, having the best weather IP camera can offer great opportunity to monitor and track their local weather. And it is definitely a useful addition to any weather monitoring setup like weather stations or outdoor thermometer. 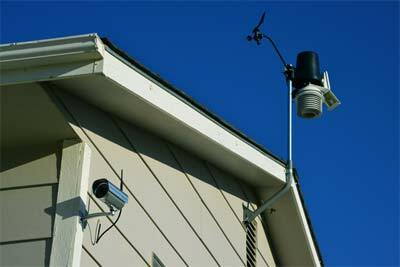 Weather station and IP camera make the perfect weather tracking setup. With this really convenient device, you will be able to visually see the conditions outside your home, over the internet, and without the need to be physically present at the location. Add the right software and you will share (FTP) and watch these images on any weather website, and app. In addition to weather monitoring you can also use the camera’s main operational purpose – security surveillance. Which IP Cam Will Give Me the Best Performance? Choosing the right weather surveillance system could mean the difference between a convenient tool, with clear HD picture, and choppy pixelated image that gives no valuable info. So, we wrote this comparison guide to outline some quality models, currently available on the market. Models that people have bought and then gave positive feedback about. First and foremost let’s take a look at these digital devices! If you already have an idea about features and models, our comparison table may push you in the right direction. But if you just have started you research, feel free to go few scrolls below and read the reviews. Capable to withstand bad weather. Some benefits of the outdoor weather IP camera: Unlike the traditional analog monitoring devices the IP camera allows you to check the conditions outside your home more easily and from virtually anywhere. These are some of the key advantages over the traditional analog units. 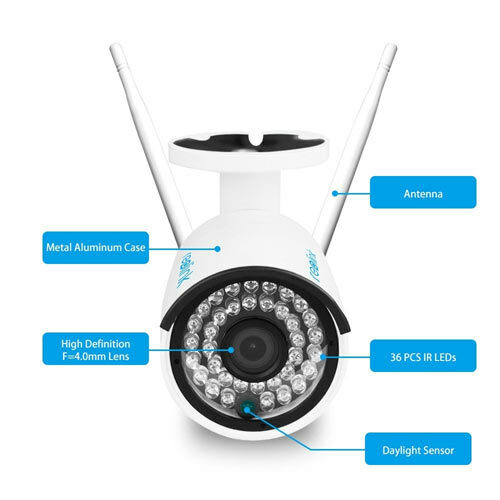 No wiring – In addition to POW/DC the IP camera can transmit the data wirelessly; meaning they can connect to your home router and provide picture to your computer. Install it and you can easily move the device to a new location and escape hassle of wire management. Remote access. – You can use Android, iPhone, iPad or web interface to connect securely to see the footage. Better image quality – With this you get the clearer view of the sky and the surrounding environment. The images and video are digitally stored and there is no need of additional conversions. Cost effective – the overall price of the full system is lower than the old analog units. Factors to consider before buying the cam. Night-vision allows you to see weather events during the night. A useful feature to have. Signal strength – If you choose to go for a wireless model, the signal strength is one of the most important factors. Physical barriers can break the signal and the camera will produce bad image. Place your router or Wi-Fi range extender closer to minimize the signal loss. Viewing angle / field of view – Wider angles give more info about the surrounding environment. Power – the most popular approach to power the device is over Ethernet connection (POE). Another option is to power it on spot with adapter. FTP upload – A necessary feature if you want to upload your camera to services like Weather underground and Weatherbug, or use your personal weather website. Weather resistant – Here things depend on you mounting location. Is it going to be protected by some structure or it’s outdoor, exposed to all the elements? Buying a weather proof device that can withstand extreme events like – higher temps, cold and rain, is always a good choice. Video quality – The resolution in which the camera records the video/image. The joy of looking the weather in glorious HD is much more satisfying than the pixelated counterpart. So go for higher resolution. Cost – The cost can vary from $50, for e decent webcam to a $1000 high-end professional device. But most devices suitable for this particular case are from $100 to $200. Installation and setup – It depends what type of camera you get. 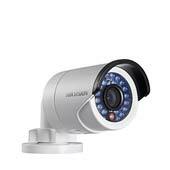 This includes cameras that are pan/tilt/zoom, wireless, weather resistant, or fixed dome. Below is the review section with couple of the best rated devices according to their owners. Recently the Hikvision brand got lot of popularity amount weather enthusiast and surveillance experts. And luckily this comes from the high quality video, and reliable performance build into their devices. Today the object of our interest is the DS-2CD2032-I – a 3 MP outdoor IP camera, with infrared illumination, 4 mm focal length, and. fixed lens. You can purchase Hikvision from variety of sources such as Amazon and Aliexpres. In the box you will find authentic disc, drill mountain template, a disk containing the software, starter guide and manuals. We recommend visiting the website to get the latest firmware updates. The camera has option for 4, 6, 8, 12, and 16 mm lenses. It is quite small and weighs around 500 grams. The infrared sensors are mounted around the lens. On the bottom, there is a sticker that reveals the lens size. The POE cord can be seen sticking at the bottom of the camera, and at the back you we’ll see a hard reset button. Three screw holes are present for secure mounting. The drill template will assist you if you decide to mount the camera by yourself. You can easily adjust the viewing angles by unscrewing and screwing the back. There’s a small cut-out at the bottom plate, so the POE cable will sit nicely once you mount it. To power the unit, simply plug-in the Ethernet cable between the camera and your POE injector, POE router, or NVR. The power consumption is around 5 W.
With this device images are clear and sharp. With setting of 1920×1080 at 15 frames per second subjects can be easily identified. Moving objects do not lose much motion details at 15 fps. Big, long distance objects can be easily identified. The camera holds up extremely well to bad weather patterns. The 2032 have decent results at night. Although distant objects are easily identifiable the closer ones appear a bit blurry. 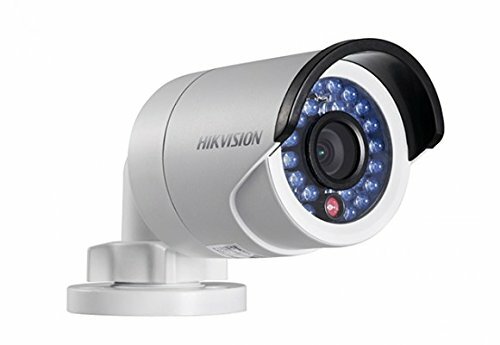 For better results during the night you can check Hikvision’s DS-2CD2332-I. It has about 30% more efficiency. Accessing the camera through the web browser is easy and the interface is very intuitive. It is compatible with Blue Iris software which you can use to monitor the weather. For iPhone, IPad, and Android devices install the Hikvision App –iVMS-4500. Configuration and navigation in the app is also very effortless. The Hikvision DS-2CD2032 handles FTP uploading very well and can be integrated quite easily with services like Weather Underground. Overall this is a very good all weather camera with good price and hard to beat picture quality. 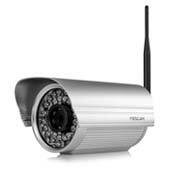 This is one of the signature bullet cameras from Foscam. It is a f:4 mm, 1.3. Megapixel camera with sleek silverish appearance. 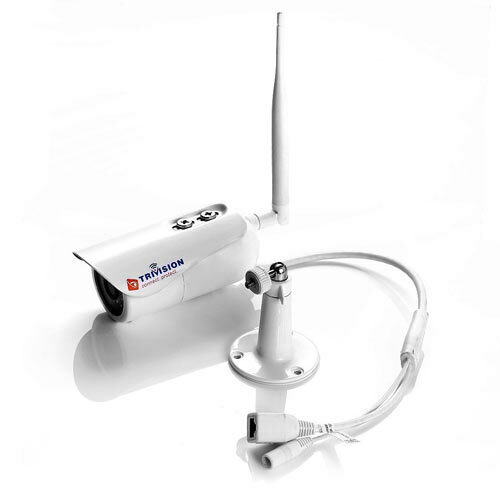 The camera itself comes with wireless capabilities which mean that you’re able to set up the camera to your network, without the need to hard wire, although the POE option is also available. Another main feature the camera is that it comes standard with 720p high-definition. This allows for a very crisp clear image viewing. 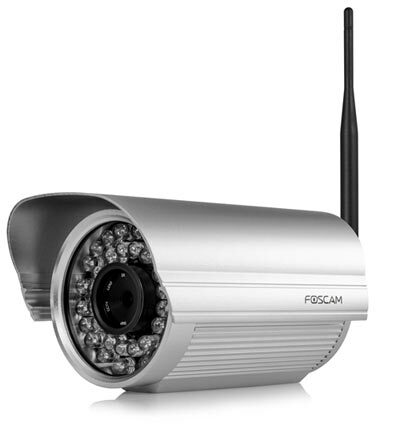 Unlike some other CCTV cameras, this one doesn’t user third party software for control, and comes with simple software by Foscam. You can install it on your computer which will allow you to control and view the feed from any web based browser. The setup, like most Foscam products, is fairly easy to manage. It can be done in a matter of minutes following the steps in the user guide. Aside from the standard Foscam apps, you can use Blue Iris app and desktop software to view and control the feed. For powering you either use POE or power adapter. The device is compatible with all mobile devices, Apple and Android based systems, and is very versatile product for mobile viewing. To install the apps just search for Foscam viewer in appropriate store. Uploading still images or video clips on your FTP is easy and it is done trough the provided software. The camera is durable within the elements – weatherproof and water resistant and can handle heavy rain. It’s very good for any outdoor or cold weather scenarios. For additional info and specification you can check the manual. For Mac it is only accessible trough the app or the browser. This Reolink models is fully functional super HD camera capable to receive and record video of up to 2560×1440 pixels. This is the highest resolution camera in our list. It is a dual mode wireless device, that supports both 2.4 GHz and 5.8 GHz networks. It comes with 16 GB build-in Micro USB card for video storage and later viewing. The camera includes f2.8 ~ 12 mm lens with 4X optical zoom and focus adjustments. Using the zoom feature is also available through the mobile app. The app itself is easy to use and with good user interface. It can automatically search and add additional devices. After the initial setup, you will be able to change settings, view live feed, snapshot, and record video. Reolink RLC-410 is made of quality aluminum material and it is fully waterproof. It is perfect for cold and rainy, weather conditions. Overall, it has a very good image quality. It is durable and the dual band Wi-Fi is interesting feature The built in 16 GB card is also a nice bonus. The camera is perfect for the intended purpose. Trivision NC-335PW is an HD IP camera with 1920 x 1080 pixel resolution, horizontal 90 degree, and vertical 50 degree viewing angle – 3 Megapixel lens with 4.0mm focus length. The main propose of the camera is security, but it proves to be very suitable for weather monitoring. In the box you will find – quick start guide, setup CD, instruction manual, mounting hardware, power cord, Ethernet cable. It is easy to install, simple to operate and even works without the need to be connected to a computer. With Internet enabled computer or mobile phone you will be able to view the feed from anywhere in the world. 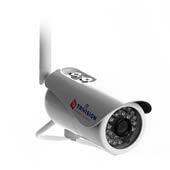 If you decided to use the camera for security reasons it has a motion detection capability. If the motion is detected the camera will instantly email you a snapshot and record video on micro SD card (not included). A waterproof box will protect the camera wire connection if you decide to install in the backyard. The camera itself has good build quality and will resist the extreme weather easily. On top of the camera there is a sun shield which you have to remove if you need to reset the camera or put the SD card. Software for PC and Mac is included . You need install it and follow the instructions to launch the remote viewing form anywhere anytime in the world. This approach will allow you to watch and share local weather events as they happen. This camera is really easy to set up and can be set up on any iPhone, iPad, and Android device. You just download AnyScene free app and follow the step by step instructions. Instant email alerts or push notifications will provide security features (main :)) while away. Trivision gives a wide range of storage options to chose from – FTP, Dropbox, Email, NAS, NVR and SD card. Smartphone ready and accessible from all over the world. Has audio which is not very good. Overall, it is really excellent camera that got all the necessary functionality. 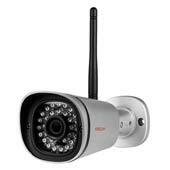 This is 2 megapixels, 1080p HD resolution IP Wi-Fi camera that is made of outdoor usage. The real angle of view is 102 Degrees and the lens itself is a f:2.8 mm. The box includes a mounting bracket for attachment on various suffices and it’s also a weatherproof camera that allows you to check what is happening around your house and building. All of this is done on Android or iOS smartphone in addition to either Mac or PC. It also offers infrared device to see the feed at night. The actual vision is up to 65 feet and the wide angle lens is great in terms of seeing the entire surroundings. If you are going to use the device of surveillance in addition to the weather tracking, this model can also send notifications when motion is detected. The box includes – antenna, mounting brackets, AC adapter, Ethernet cable (I case you don’t want to use wireless connection and POE), and there’s also CD for installing software on your computer Mac or PC. The device includes something called lifetime support and installation. You can simply call customer support rep and they will walk you through the process. We think that won’t be necessary because it’s pretty simple and straightforward in terms of setting things up. Design wise it feels very substantial. It has compact aluminum body that is quite hefty and gives reassuring feeling. This will definitely help the weather resistant properties. Even if it rains, hales or snows, the FI9900P should have no problem and withstand these extreme weather conditions. There is also a strong glass that is protecting the lens from damage. On the bottom there’s access to a QR code that you can scan to connect your phone to the camera. The application itself is very simple to setup. Basically you open it up and it prompts you to create login account. After you do that you can add a camera by scanning the QR code at the bottom of it. You can also add multiple cameras onto one account. The provided software for PC and Mac has a lot for features and will satisfy most of your needs. There is a FTP upload section, so there is no problem setting up the Weather Underground account. Blue Iris software is also compatible with this model. Wi-Fi seems to be pretty speed and the camera reaction time is very good. Thanks for posting this information about IP cameras for weather tracking. Can you tell me exactly what equipment is needed to get an image with weather data on it like the one at the top of the page? That is so cool! Do you have to purchase a weather station and a camera separately? Which ones work together to produce the time-lapse image you show? I want to be able to see the weather happenings at a remote vacation property, and have temperature, wind, etc data to go with the image. Many thanks! You can use any HD model like Hikvision or Foscam to record the video. Most of the cameras on this page have time laps option. This is the easy part. The more tricky section is sending the weather data to the camera for overlay. For this to work, you will need a weather station. You write (via programming language) the weather data into properly formatted XML file and then send the file to the camera. There are guides online explaining the process. Currently I am writing a detailed guide on this exact topic. I’ll keep you posted. Did you ever write this guide? I am interested in having a time lapse at a somewhat remote location with access to satellite broadband, so data is a bit precious. Any general help you can provide will be more than welcome. I intended to comment on this a few moments ago, but thought I would reply to your specific comment. If you received the other reply/comment, my apologies. Most of the cameras here have the option to make low quality high interval snapshots. A safe bet is the Hikvision model. Go to your camera settings Storage > Schedule settings > Capture > Capture parameters, and enable the timing snapshot option. In the same setting window set the resolution to low, choose a low quality compression, and adjust the snapshot interval to desired timing. Upload Via FTP (https://www.youtube.com/watch?v=AK0bzAsfF7M). Buy cheap FTP hosting somewhere and upload them. Use the camera settings to setup your FTP server. For easy image access you can download a mobile app to log in into your FTP server. Or send them via email. Also available trough your camera setting. I’m also interested on how to do this, pleeeez direct us to the right place where to find these instructions? Which of these is the easiest to set up in a time lapse mode at a to be determined frequency? (Don’t know if it will be 1 min or 10 min) This will be for a web cam pulling from satellite broadband, so actual video would eat up too much data. This will be set up by a relative novice in a fairly remote location. 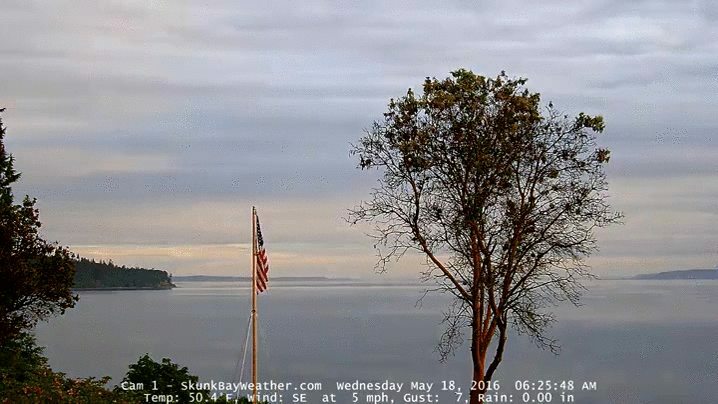 Are there any tech guys here that can help us setup our weather webcam please? We are based in Brisbane Australia but guess you can be anywhere to help set us up? Hi, I’m trying to find a solution too to some of the questions above. My need is to overlay the weather graphics on a live camera that is sending live visuals to our studio. So the camera is connected to a wireless radio sender, and received a few kilometers away. How do I super impose the live weather data on top of the live camera view? Hi.. I am in the market for a weather cam, however I’m looking for one that I can remotely thru my web browser of mobile app have the ability to pan and tilt (move around in every direction). Let’s say theres storms to the south, I want to be able to pan there – storms to the NE, I want to pan there – what is a good camera to enable me to do this? thank you.